This guidebook offers 20 sportive routes in the most challenging and scenic cycling areas of south west England and south Wales. Cornwall, Devon, Somerset and Avon and Dorset, all have miles of cycle-friendly roads suitable for sportive training. Graded routes on quiet country roads can be mixed and matched. With its mild climate and great sunshine record, the south west is the perfect playground for year-round sportive training regimes. The south west plays host to many well-known mountainous and hilly regions, and this book takes full advantage of these quality training grounds. Some of the toughest climbs in the UK are to be found here, but there's more to the south west than just climbing. This guide features 20 challenging yet achievable training rides for all sportive enthusiasts to enjoy. The moody backdrops of Dartmoor and Exmoor to the flat open going of the Somerset Levels and the rolling countryside of Dorset's Jurassic coastline, Sportive riders will enjoy testing themselves against some of the toughest and most scenic terrain that the UK has to offer. 20 sportive cycling routes in the best cycling areas of south west England are uncovered in this guidebook. Ideal for training, or simply spending some great days on the bike, the rides range between 59 and 119km (36 to 74 miles) in length, and offer a full range of challenges; from long, fast flat routes; perfect for pacing, to tough hill climbs on the Downs and Moors throughout the south west. The 20 sportive routes are found in Cornwall, Devon, Dorset, Somerset, Wiltshire and Gloucestershire, as for north and east as the Wye Valley and Swindon. 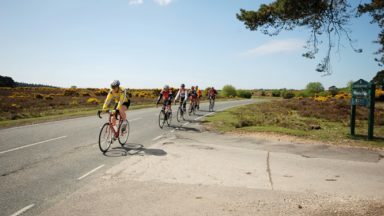 The range ensures that there is plenty of riding to be found, throughout the region, not to mention the companion Sportives guidebook to routes in England's south east. 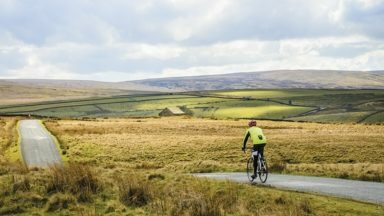 From the Cotswolds, to Dartmoor, Exmoor, Bodmin Moor, into Wales and the south coast, there are miles of of cycle-friendly roads suitable for sportive training. All 20 routes are graded for difficulty and include timings, ascent, food-stops and access information, as well as annotated route maps and clear route descriptions. 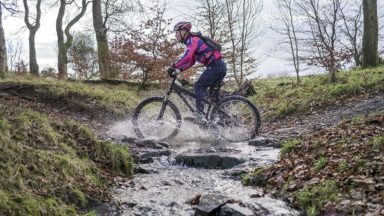 Sportive cycling is a growing sport, and this guide provides routes for experienced riders and those new to this sport. Useful information on bike maintenance and equipment, to travelling around the areas with your bike and advice on accommodation is also included. The result is a sportive guidebook that will prepare you for the challenges ahead, and allow you to explore the best cycling the south-east has to offer. Colin Dennis has produced two guides that will be of great interest to any cyclist who likes a challenge in great countryside. With many miles in his legs, he is admirably qualified to guide us on these routes; a cheery attitude shines through in the text and will appeal to those who have thought about taking on bigger challenges but have not yet got round to it, or would rather not but like the idea. The author offers advice to both experienced and newcomer alike. looking to build up stamina for a “big one.” Equally they give the opportunity to test out one’s ability before joining the crowds up Box Hill or elsewhere. And, actually, these routes would make interesting day rides at a more leisurely pace; refreshment information is given and one can always double (or treble) the times suggested as suitable for the route. 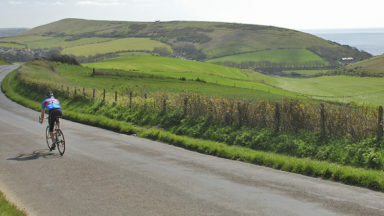 Routes on Bodmin Moor, Exmoor, Dartmoor, the Cotswolds, New Forest, the Downs and Weald and Chilterns, amongst other southern hills, cannot be flat. Nor is that desirable from the point of view of the challenge rider. Mr. Dennis has sought out hilly sportives. Take a look at the route profiles. For the cyclists travelling at more of a touring pace, the hills make for good views, and grand airy cycling. Many of these routes would make good touring routes with a challenge, though none would be for the faint-hearted. Of course, there’s no need to rush, but, should you wish to do so, then the advice and guidance is here. pocket and there is sufficient detail to help with refreshments and accommodation. following them in my memory and on the map. A really interesting addition to the library. Colin Dennis has been riding bikes of one sort or another for longer than he dares to remember. 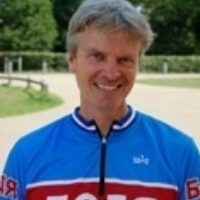 His passion for road and off-road cycling has taken him all over the UK and continental Europe, both leading expeditions and for personal pleasure. 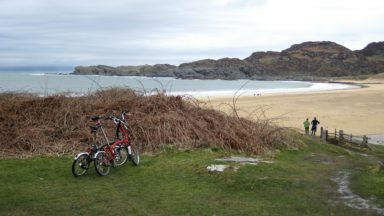 Plotting, planning and escaping to new locations are pastimes that have driven him for many years, and working as both freelance copywriter and cycle guide provides a happy balance at home and work. Colin is never happier than when he's struggling up a steep climb behind a group, usually covered in mud, but as long as there's a warm tea shop involved – everything's possible.